First he was Snoop Dogg, then he was reincarnated as Snoop Lion and now he's rechristened himself Snoopzilla for 7 Days of Funk, a new collaborative project with groove singer Dam-Funk. The duo released the album's first official single, "Faden Away," today on iTunes and are set to release an album, also titled 7 Days of Funk, on December 10th on Stones Throw Records. 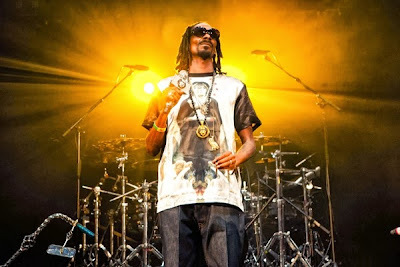 Snoop and Dam-Funk first paired in 2011, when the rapper-singer invited the funk vocalist onstage for a performance at SXSW. 7 Days of Funk will feature cameos from Snoop's Tha Dogg Pound cohorts Daz and Kurupt and drummer-singer Steve Arrington, a recent Dam-Funk collaborator. "Snoop knew what I was thinking without me having to articulate it," Dam-Funk added in the same statement. "That's how you know when you gel artistically with someone. These beats were made for him and he laid down some of the smoothest harmonies and melodies I've ever heard. It's hip-hop, but you can also hear what we grew up on, from Zapp to Evelyn 'Champagne' King and Patrice Rushen." The old-school influence is also apparent in Snoop's new name; it was inspired by Parliament-Funkadelic bass maestro Bootsy Collins, who sometimes used the nickname Bootzilla.